Krkonoše (CZ)/Karkonosze (PL) Mountains National Parks are state properties of the Czech Republic and Poland. The parks are a trans-boundary UNESCO Man and Biosphere Reserve. Two Observer Stations, a Czech station called Krkonoše and a Polish station called Karkonosze, are situated in the park. Because of their location within the same mountains, this catalogue gives a combined description of the two stations. The area is known for its high biodiversityBiological diversity. The many and varied forms of life on Earth (collectively known as biota). As well as diversity of species (species diversity), there is also diversity within populations of a... More in four altitudinal vegetation belts, from sub-mountain to alpine. The Krkonoše/ Karkonosze Mountains National Parks (NPs) are situated on both sides of the Czech/Poland state border and form the highest part of the Hercynian mountain system in Central Europe. The stations are situated in the tundraA type of ecosystem in which tree growth is limited by low temperatures. The origin of the word is from from the Kildin Sami word tūndâr, meaning "uplands" or "treeless mountain tract". In the northern... More which covers the subalpine/alpine belt of both NPs. The mountain belt is densely occupied by mountain chalets. Nearest towns are Karpacz (PL, 8 km to the north) and Vrchlabi (CZ, 10 km to the south). The tundra – above the Picea abies tree line – has the unique character of a relic island of the sub-arctic-alpine tundra (thanks to its isolation from Scandinavia, the Alps and the Carpathians since the end of Pleistocene). Three zones are distinguishable within it: 1. “stony-lichen tundra” with a mosaic of lichens, bryophytes, low grasses, and bushes on alpine peaks, 2. “grassy tundra” with grasses, subarcticThe area immediately south of the Arctic circle. Generally, subarctic regions fall between 50°N and 70°N latitude, depending on local climate. In other words, the subarctic is the region between the... More mires, and shrubs of Pinus mugo (vicariance of Betula nana and B. czerepanovii) in the lower plateaus, and 3. ”flower rich tundra” with tall herbs and grasses in the lee of the glacial corries. The area exhibits many plants and animal species with arctic-alpine distribution. The Polish Karkonosze National Park was established in January 1959 and the Czech Krkonoše National Park in May 1963. However, scientific research in this area started already in 1786. At present, 400 different scientific projects are carried out each year on both sides of the border. We can offer local accommodation, high speed internet connection and several well equipped stores in the neighbourhood. The research focuses on faunaThe animals that live in a particular region, habitat or time (such as geological period like the jurassic). For plants, we use the term flora, and to collectively refer to all... More, floraThe plants that live in a particular region, habitat or time (such as geological period like the jurassic). For animals, we use the term fauna, and to collectively refer to all... More, lichens, bryophytes, algae, GIS, geologyThe study of the solid Earth, rocks and processes by which rocks form. 'Geo' is derived from the Greek word for Earth.... More, geomorphology (waterfalls), environmental chemistryThe study of matter at the atomic and molecular scale.... More, climatology (avalanches), forest management, pedology, recreation, speleology, sociology (socioeconomic), former ore mining, agriculture, archaeologyThe study of past human activity, mainly through studying artefacts and structures left behind, and by revealing other evidence of past activities. The first systematic archaeological excavations in the Arctic... More (history) etc. In addition, a lot of different databases containing data from animate (biotic) and inanimate (abiotic) nature are available. 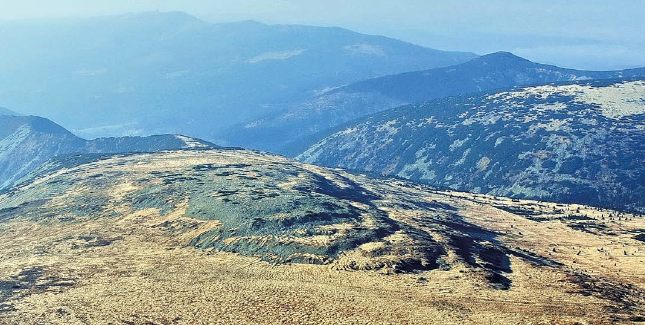 The Krkonoše/Karkonosze Mountains has been inhabited for a long time. Besides nature protection and research, the area is also used for forestry, agriculture, tourism, and sports. The Krkonoše/Karkonosze Mountains is a popular tourist destination for hikers and skiers with about 5-6 million visitors per year on the Czech and 2.5-3 million on the Polish side (2002). Krkonoše/Karkonosze Mountains can be reached by car, bus, and train. It will take around two hours by car from Prague airport to Vrchlabi and another 30 min from Vrchlabi to the tundra zone. Access from Poland is via Karpacz.